A bit too baggy but good. They appear to be of very good quality. Fit wise, they leave way too much room around the inner gloves ... I hope the extra fabric won't get in the way while operating brake and clutch levers. Not yet tested while riding. 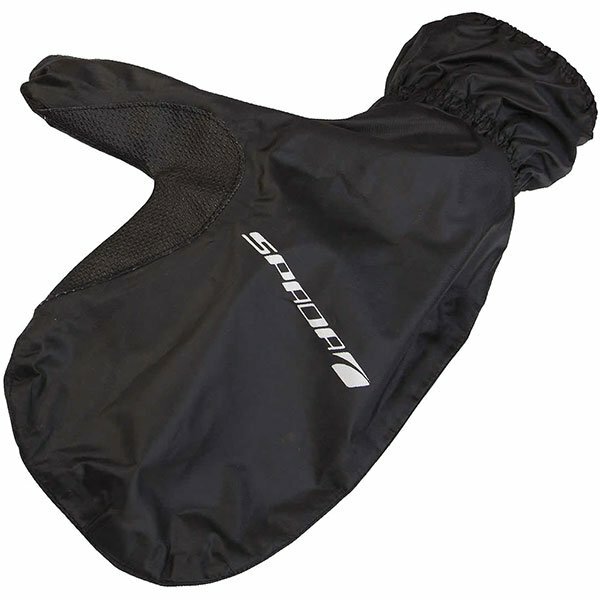 They keep you warmer than heated grips when used with winter gloves. It is a bit tricky to put them on and you do loose the feeling for controls a little. I use them mainly on motorways. Use these with my older gloves that were no longer waterproof, keeps the moisture and the wind chill at bay. Good if you have a distance to cover and need the extra protection, they also wrap up quite small with the waterproofs so they are easy to carry. My old waterproof gloves now let in water but are still useful when the weathers dry. These overmitts are easy to carry in case of rain so I don't need to bin my old gloves just yet. Bear in mind there is a knack to getting them on quickly and bike control feels a little odd at first but for temporary use they're fine for me. Keeps you from wet AND cold. Very light, I always have them in my work bag. Great product! Simple and effective overfits, light enough to feel what's going on, but strong enough to keep out rain (and draughts if you wear them over short gloves). I will carry them everywhere - especially with more weather on its way. Does EXACTLY what it supposed to. No surprises. Just don't expect a high level of sophistication... this basically a rainsuit for your hand! ... but great to have on the bike in case it rains. Worked a treat in the rain. Bit or a chore getting them both on but that's mittens for you. Would possibly have gone a size down as am still wearing my summer gloves. Stops the wind chill and rain. Fits over my winter gloves, allows me to use the heated grips in the rain / cold, which causes the Gortex liner to work in reverse ! Bought Medium and fits over winter Medium gloves. Fit well and waterproof. I dont get wet hands.. bonus.. I was after some reasonably priced waterproof gloves but they all seem to be heavyweight and not what I wanted for the summer. I came across these mitts by chance and thought they would be ideal to cover my summer gloves. I used them on the National Rally this year and they did the job perfectly, tucking up inside my jacket sleeve and keeping me dry during a damp night. I bought the large size because my gloves are large but wonder whether a medium would be a snugger fit. I have heard that some waterproof gloves don't work very well with heated grips but the mitts were perfect. Good value, would recommend. I wish I had bought these 10 years ago. Say good bye to wind chill. Ordered Large to fit over gloves. Fit well, so far found to be very good.